Om Ah Hung in Uchen, Umed and Khyuyig script. The mantra represents Body, Speech and Mind of Buddha. Both Thais and non-Thais are welcome. No prior knowledge of Tibetan is required. Calligraphies reflect the beauty of art and peace of mind. Their messages touch on the core of universal human aspirations. Yontan, the Instructor at his office at the Foundation House. The Thousand Stars Foundation is pleased to announce a unique and rare opportunity for interested persons to have a glimpse of this special art using Tibetan script. 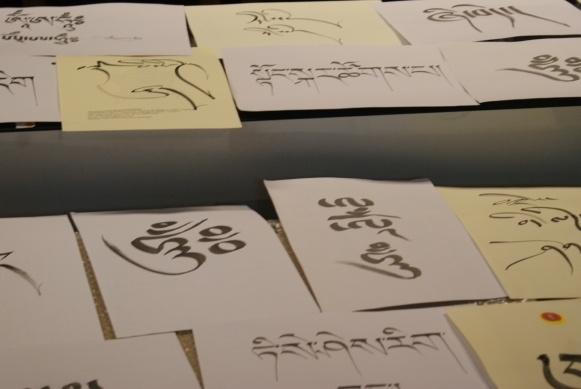 This is the first time that the training of Tibetan calligraphy is offered in Thailand. Practicing calligraphy enhances concentration, effort, patience, and most importantly peace of mind. Uchen “Big head” – script of clarity used mainly for printing books and carving on rocks. 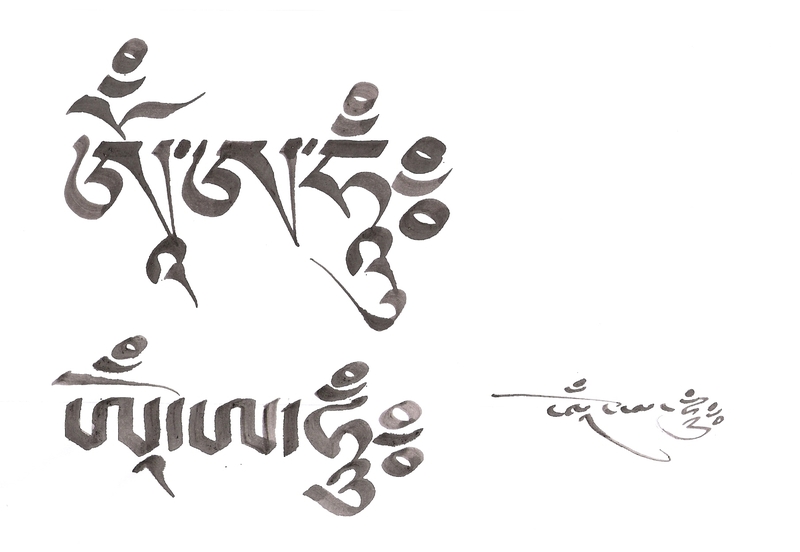 Umed “Headless” – script of elegance used mainly for Buddhist texts, posters, logos and names. Khyuyig “Cursive script” handwritten script used in letters and everyday life. Hand-made bamboo pens of various tips and ink. Messages like peace, happiness, compassion, wisdom as well as common mantra like Om, Ah, Hung are among what to learn in this class. They are universal human aspirations. Students do not need to have prior knowledge of Tibetan. 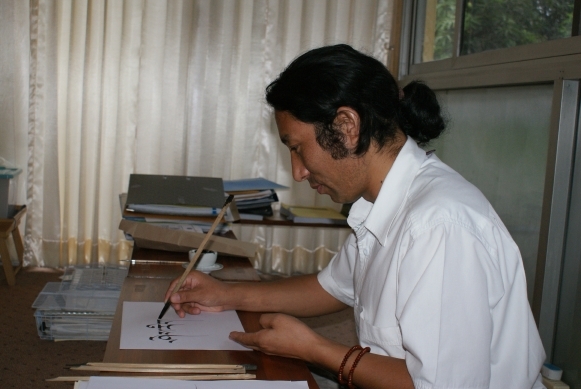 Meu Yontan Tongdrol practiced calligraphy for more than 20 years at Dokden Monastery in eastern Tibet, where he served as the monastery’s secretary and instructor of Tibetan grammar. Since July 2007 Yontan officially joined the Thousand Stars Foundation in preserving Tibetan heritage and promoting Tibetan ancient wisdom to the world. 700 baht for a one-day workshop. The fees include the instructor’s honorarium, writing materials (pens, paper), lunch and snacks. Ms. Worawanna : 1000tara@gmail.com. Registration closes August 8, 2008. Foundation House can be downloaded at http://www.thousand-stars.org (click on the page of activities) or requested at the email address above.